The opening Sunday morning service began with the choir singing “I Lift My Hands in Total Praise to You.” Lisa Pressley sang “O, I Want to See Him,” and before the sermon, Karolyn Segres sang “Where Could I Go?” Bob Downey, Director of North America Work, took his text from Philippians 4:19, bringing out that God has an endless supply to provide for every need. During the afternoon youth service, TJ and Abby Wyatt sang “Open the Eyes of My Heart,” and then a mixed ensemble sang “Every Praise Is to Our God.” Before the sermon, Martha Dixon sang “I Wanna Be Ready.” Woodrena Segres, from Florence, South Carolina, read Ephesians 6:11 for her text, and encouraged the young people to take off the labels of the world and put on Jesus. 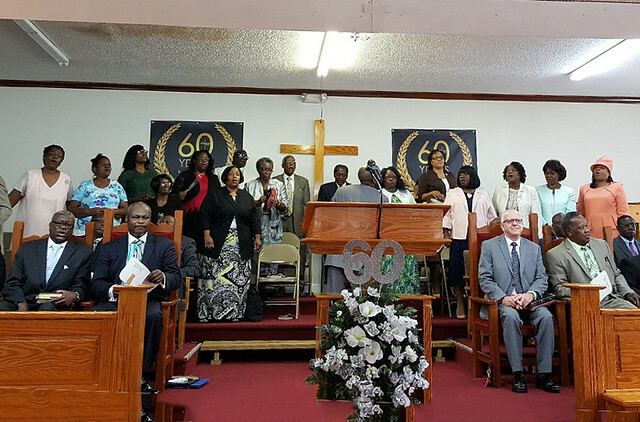 Sunday evening, the choir opened with “I Am Redeemed.” Xavius Robinson stated that the first Century camp meeting was held in October 1958, and each evening service would highlight some of the pioneers from the past sixty years. The choir sang “He Will Guide Me All the Way,” and before the sermon, Leonard Pressley sang “My God Is Real.” Eli Segres, the pastor in Aiken, North Carolina, read Mark 4:35-39, and encouraged the congregation to call on Jesus and let Him take control during the storms in their lives. On Monday evening, the choir opened the service with “Jesus On the Main Line” and “Sign Me Up for the Christian Jubilee.” Veda Ojo shared the testimonies of Cato Bush, who was saved in 1922, and Richard Barney, who traveled over three thousand miles in a Model T Ford to attend the 1934 Portland camp meeting. Before the sermon, Debra Fears sang “Take Your Burdens to the Lord and Leave Them There.” Walter Cobb Jr., pastor of the Old Springville Road church in Birmingham, Alabama, read Genesis 1:1 for his text, bringing out that God had a plan from the very beginning for souls to be saved, sanctified, and filled with the Holy Spirit. On Tuesday morning, Barbara Steele sang “Close to Thee” before Edward Dixon, the pastor in Columbus, Georgia, read 1 John 5:4-5 for his text. His topic was “Overcoming Faith,” which never wavers and is always victorious. On Tuesday afternoon, a delegation of ten held a service at the local nursing home in Century to commemorate a tradition over the past sixty years. During the Tuesday evening service, Johnny Wyatt Jr. shared the testimony of his grandfather, Isaac Davis, who was saved in 1947 and appointed US Southern and Eastern District Superintendent on two separate occasions in 1980 and 1996. He oversaw the renovation of the campground cafeteria. Before the sermon, Jessica Ekanem sang “For Your Glory.” Josephine McElveen, the pastor in Washington, D.C., read Hebrews 11:8-10 for her text, bringing out that the citizenship of the redeemed is now focused on Heaven, and not on the things of this world. Wednesday was Women’s Day, and began with a processional by the ladies, dressed in white, singing “We’ve Come this Far by Faith.” The theme was “Christian Women Proclaiming the Gospel.” A young girls’ group sang “The B-I-B-L-E,” and were followed by the ladies’ choir singing “There’s Something About that Name.” Woodrena Segres commemorated the ladies who had passed away during the previous year, and Karen Conyers commemorated those who had major milestones. Officers for 2018-2022 were presented, and Brother Bob was asked to offer a prayer on their behalf. After Pamela Morrison read the Scripture reading from Psalm 103, Kim Lewis sang “There’s No One Else Like You.” Berthena Conyers, from Kingstree, South Carolina, took her text from Genesis 1:27-28, and encouraged the women and girls to be saved, sanctified, filled with the Holy Spirit, and let their lights shine as they proclaim the Gospel to others. During the afternoon Women’s Day activities, it was brought out that the women’s organization was started in the 1960s to take on projects that would enhance the living conditions on the Century campground. Sister Josephine recognized Mary Kelly, the first president of the women’s organization and founder of the Apostolic Faith Church in Washington, D.C., as well as the ten succeeding presidents. Three other women spoke on what the theme meant to them—Georgette Bush, Ardienna Elliott, and Paulette Wyatt. Then Miriam Udo gave a brief overview. A marriage seminar was held Friday morning, led by Andres Mercedes, the pastor in the Bronx, New York, focusing on “How to Choose the Right Spouse.” There was a youth service in the afternoon, followed by an evening evangelistic service. On Saturday, there was a picnic and Bible Bowl in the afternoon, and a music concert in the evening. The concluding service was held on Sunday morning. Many were blessed at this year’s camp meeting as they tarried around the altars of prayer, and all who attended are anticipating future camp meetings in Century as Jesus tarries.